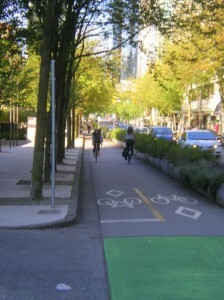 One of Vancouver's many protected bikeways. Photo: Chad Mullins. Attending the Velo-city Global 2012 international cycling planning conference in Vancouver, BC from June 25 to 29, provided so much information I will have to share it in several parts. First, I will describe Vancouver’s bicycling environment from the standpoint of a stranger, riding to and from the conference. Then, I will tell the story of how Vancouver got to where it is today, and what is planned for the future. The final section will cover the conference themes and presentations. I do not pretend to be an expert on these topics; I am sharing what I observed and scribbled in my notes. There may be inaccuracies. Furthermore, I admit to a strong bias – Vancouver has won many awards in recent years as the world’s most livable city, and is recognized as one of North America’s most walkable and bikeable cities — from my limited perspective, I wholeheartedly agree. Vancouver is a city that works; people are moving there because it is a community where people want to live. The downtown population has grown by 75% in the 15 years since they set in place the transportation policies to make Vancouver a walking and biking friendly place. I admit I was nervous riding off on a bike-share rental bike on the late side of rush hour from downtown in a large city to search for my free home-stay. The bike-share bikes were heavy beasts with three inadequate gears. Armed with a good bike map and a route downloaded from TransLink, the Vancouver transit website, I pedaled. I had to cross a long bridge across the bay with bikeway approaches and departures that on the map looked like a tortured bowl of spaghetti, but the separated cycle tracks and bikeways and excellent signage made it a piece of cake. Some bridges have separated bikeways while others have shared paths, still I noticed many speedier cyclists were in the traffic lane on the bridges keeping up with motorized traffic. My trip started on a recently installed downtown two-way cycle track. Cars were restricted from making right-hand turns on red to protect the cyclists. In some places cyclists had their own light to precede the motorized traffic. Usually, wherever there is a bike route on the road the speed limits are 30 km/h (18 mph) or less. Although I had planned to ride directly to the scenic shared bike/ped paths across the bridge, more tempting was a scenic detour on the beautiful greenways that surround the bays and rivers that separate the peninsular fingers that make up Vancouver. Imagine a continuous linear park facing the seawall or a beautiful beach with separate twenty foot-wide bike and pedestrian paths. After taking a short ride on the “seaside” route, I found the separated path leading up onto the bridge. Coming off the bridge on the shared bike/ped path, the paths started to diverge as I approached a busy 6-lane street. There I found separate parallel crosswalks for pedestrians and bicyclists with separate signal control buttons to stop traffic and separate traffic crossing signals. During the course of the conference I rode on several different types of “separated” or “protected” bike paths. Where streets were wide enough there were one-way separated bike paths on each side; however, many of the streets were narrow and could only be fitted with two-way cycle tracks on one side of the road. Most had been adapted to the bike routes and had lost a travel lane in the process. Because two-way cycle tracks can present visibility and awareness challenges at street crossings and curb cuts, the cycle tracks were marked by the use of solid bright green lanes painted across the entire crossing as a warning for both drivers and cyclists. For many crossings the bike pathway was also raised as a further warning. Back to my commute. The excellent wayfinding directed me to the bike route to my host’s residence. At this point I am riding on bike lanes in a high-density commercial/apartment neighborhood. As it became more residential the bike lanes gave way to “sharrows” on a shared roadway. Most of the residential bikeways consist of well signed bike routes on quiet residential streets with bike symbols on the pavement similar to our “sharrows” without the chevrons. Vancouver has been doing bicycle boulevards for over a decade, long before anyone thought to call them bicycle boulevards. Vancouver has a consistent “grid” pattern with much smaller blocks than Salt Lake’s, so it is easy to find well connected routes that parallel busier commercial streets and heavily trafficked arterials. The next pleasant surprise came when I crossed a busy street. A bike lane suddenly appeared as I approached the intersection and directed me to a protected bike waiting area inside a raised island with a traffic control button to stop traffic. The intersection crossing was blocked to cars. Cars were directed to the right of the protected bicycle crossing, where they could only make a right turn. This street crossing pattern was repeated throughout my rides, whenever a bike route crossed a busy street. As my bike route moved into residential neighborhoods another commonly repeated traffic calming feature came into view. Stop signs, which are not bicycle friendly, are seldom used in Vancouver residential neighborhoods. Instead a mini-roundabout is placed in the intersection, usually every other block. The mini-roundabouts are concrete islands placed in the middle of the intersection. The islands are quite small, but large enough to keep motorists and cyclists from zooming through the intersection. The islands have a small amount of landscaping in the center, probably cared for by local residents – some were minimal while others were carefully tended with spectacular blooming flowers. The locals were very sociable as they rode beside me. Many were curious about the bike-share bike I was riding, and when they discovered I was from out of town they offered tips about the route and suggested interesting sights I should visit. Research in the Netherlands showed that one of the desirable features of cycling is sociability – and since they encourage cycling, they design all cycling facilities wide enough to accommodate cyclists riding side-by-side. My rides were easy, convenient and definitely not stressful. And because traffic priority is given first to pedestrians, second to cyclists, third to transit and last to single occupancy vehicles, the bike commutes within the City are faster than by auto. Biking is a great way to see Vancouver — need I say more. We will print parts 2 and 3 in upcoming issues.